Was the Milky Way once an active galaxy? Two bubbles 50,000 light-years across may hold the answer. The anatomy of the Milky Way is much more complicated than you might imagine. The most recognizable building blocks are certainly the spiral arms, the high-density regions of a disk that’s filled with gas, dust and stars. Delve deeper, however, and you’ll find structures that are larger and more intricate. There are the halos, containing stars, globular clusters, gas, and dark matter. There’s a bulge near the galactic center, as well as two distinct components of the disk itself, the thin and thick disks. We also know about smaller structures like the Gould Belt, an enormous ring of stars and gas near the Solar System that I wrote about a couple of weeks ago. To properly understand our galaxy, we need to use light beyond the visible spectrum. For instance, x-rays help us identify supernova remnants, while radio waves and infrared light have let us peer through the dust lanes of the galactic center. 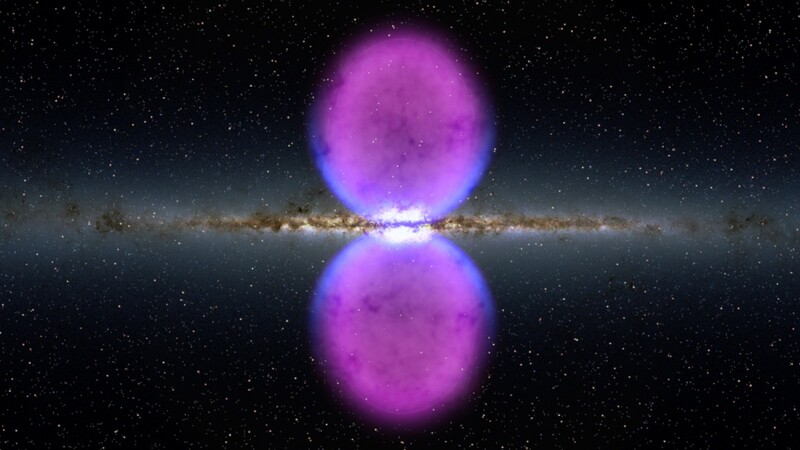 Eight years ago, astronomers using NASA’s Fermi space telescope used another handy tool — gamma rays — to make an unexpected discovery: two “bubbles”, each 25,000 light-years in diameter, extending out of the galactic plane from either side of the galactic center. A visualization of the bubbles straddling the Milky Way, showing gamma-ray data from Fermi (pink) and x-ray observations by ROSAT (blue). From top to bottom, the structure is 50,000 light-years across. Image credit: NASA’s Goddard Space Flight Center. These “Fermi bubbles” are still not well understood. It takes an energetic event to form a structure half the size of the galaxy in length, and models indicate such an event must have happened fairly recently — within the last ten million years. Two main hypotheses have been proposed, involving powerful jets from a supermassive black hole or a burst of star formation. Which of these is considered the most probable? Read on to learn about one of the most dramatic events in the Milky Way’s recent history. How do you map the sky? 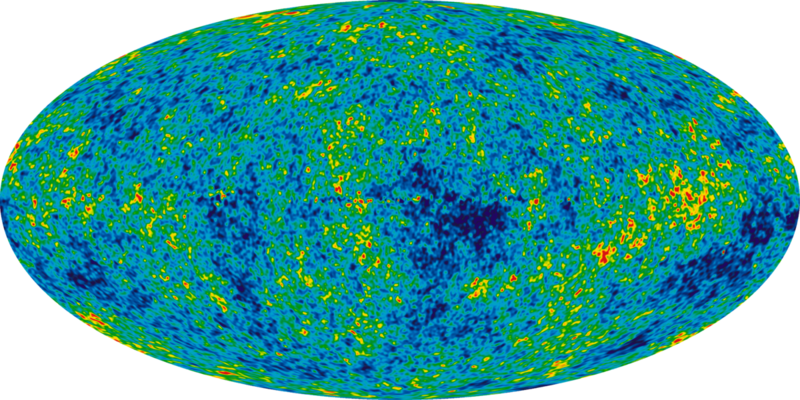 The WMAP nine-year data release gave us an even more detailed map of the cosmic microwave background (CMB). Like Fermi, the team had to subtract out known galactic sources before isolating their target. Image credit: NASA/WMAP Science Team. Two years into its mission, the Fermi Gamma-ray Space Telescope had made enough observations to allow some astronomers (Su et al. 2010) to construct high-energy maps of much of the sky. A large field of view and a large wavelength range made it possible to detect gamma rays from across the galaxy. Similar things had been done at other wavelengths, notably by the Wilkinson Microwave Anisotropy Probe (WMAP) and the European Planck spacecraft. For the data to be at all useful, however, the gamma ray maps had to be adjusted to remove contributions from the cascades of particles formed by cosmic rays. Several models of this excess emission based on the distribution of interstellar gas and dust were applied. After masking known point sources of gamma rays, as well as the inner regions of the galactic disk, the team was able to see the clear outlines of two enormous bubbles, comprising a single giant figure eight. Fig. 4, Su et al. 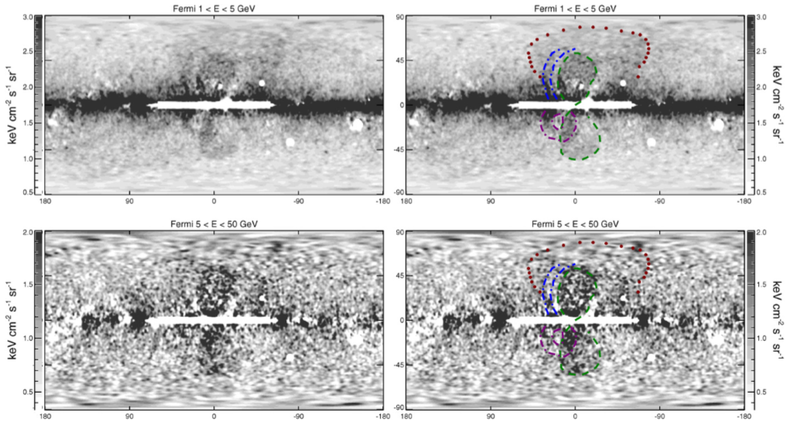 The Fermi bubbles are visible in these annotated residual maps, after subtracting out the template, point sources and the inner portion of the galactic disk. The green loops outline the bubbles and the blue and red curves mark out other features. After studying the spectra of both the north and south bubbles, the Fermi group decided to test the physicality of the structures by scanning other all-sky survey maps for similar structures at the same locations. 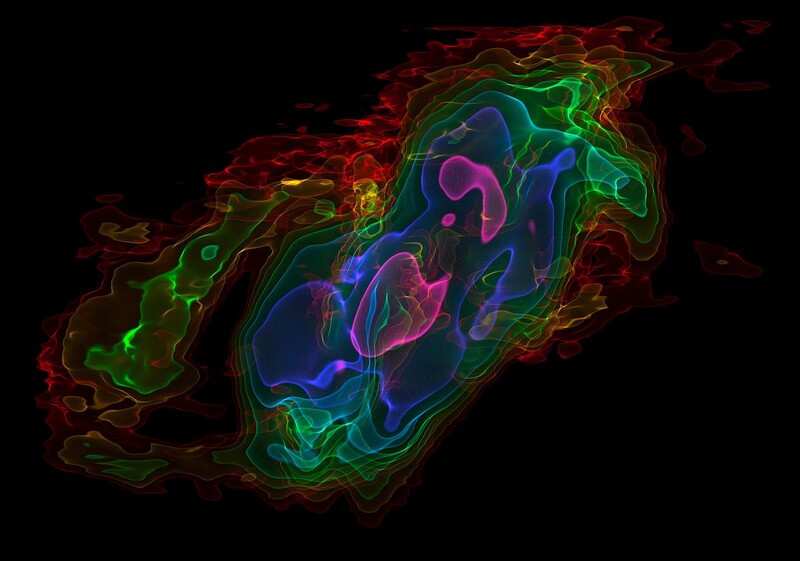 Data from ROSAT, a German x-ray telescope, outlined segments of the Fermi maps, and WMAP showed a microwave “haze” that covered much of the interior of the bubbles. In short, the region displayed similar emission at other wavelengths, clear proof that the Fermi bubbles were real. Fig. 18, Su et al. The data from ROSAT shows x-ray emission close to the galactic plane, while the WMAP haze clearly fills most of the Fermi bubbles. Gamma rays can be formed by a number of mechanisms, so merely observing a bubble-shaped excess tells us little about what we’re actually looking at. Fortunately, astronomers had already studied the relevant WMAP data in detail, and it became apparent that the microwave haze could be explained as a form of synchrotron radiation, photons emitted by fast-moving charged particles traveling along curved paths. Magnetic fields are usually responsible, which is why synchrotron radiation is often observed coming from objects with strong magnetic fields, like black holes and pulsars. Given the size of the area responsible for the WMAP haze, a large-scale magnetic field was needed. Fortunately, a galactic magnetic field permeates the Milky Way. While weak, it is still able to accelerate electron cosmic rays enough to produce ambient synchrotron emission across the galaxy. An arc-shaped shock front could provide enough of these fast-moving electrons to be responsible for the microwave excess. What was even more exciting was that this same population of electrons, expanding outwards, could also produce the gamma ray spectrum observed by Fermi! 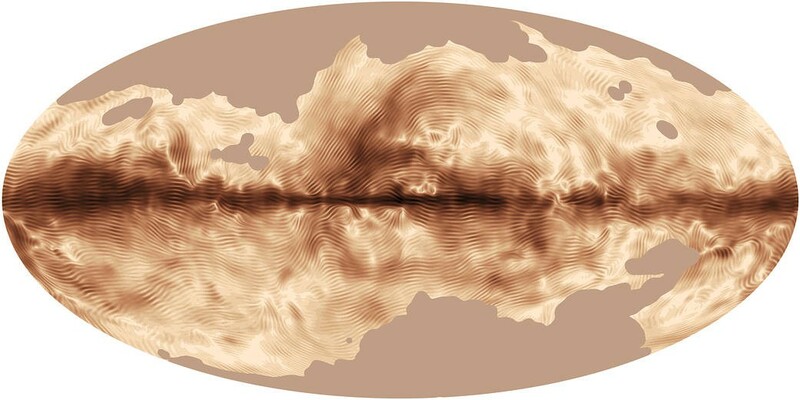 The magnetic field of the Milky Way, as seen by Planck. Image credit: ESA/Planck Collaboration. The mechanism behind the gamma-rays is something called inverse Compton scattering. Regular Compton scattering is the result of a simple interaction between two particles. When a photon hits a free electron, some of the incident photon’s energy may be transferred to the other particle, which emits a lower-energy photon and moves off in a different direction. If the energies of the incident and outgoing photons can be measured, the scattering angle can be calculated using four-momentum and Einstein’s mass-energy relation. Inverse Compton scattering proceeds in the opposite way. If a fast-moving electron — such as one from a shock front of cosmic rays — collides with a photon, it can scatter the photon away with a higher energy. This radiation is often observed from electrons inside the energetic jets of supermassive black holes at the centers of active galaxies. Another source, of course, are ultra-relativistic electrons coming from cosmic rays — like the ones responsible for the synchrotron emission seen by WMAP. If this same population of electrons was also emitting gamma rays through inverse Compton scattering, it would produce a signal exactly like the one seen from the Fermi bubbles. What does this tell us about the Milky Way? The Milky Way does have a supermassive black hole at its heart, the radio source Sagittarius A*. However, it’s currently quiescent, meaning that it isn’t undergoing any significant accretion or emitting powerful jets. There are occasional interesting events, like a gas cloud passing too close, and we have signs that there may have been dramatic interactions with nearby stars in the not-too-distant past, but for the most part, our supermassive black hole is pretty quiet. Nonetheless, the Fermi bubbles are positioned suspiciously symmetrically on either side of the galactic center, meaning that something dramatic must have happened, maybe only a few million years ago. 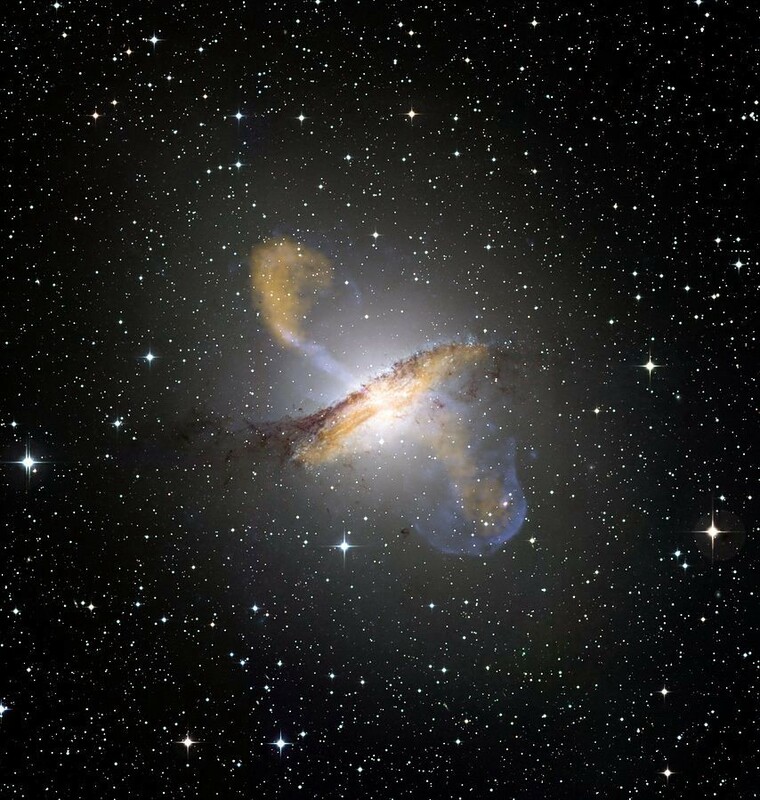 Centaurus A, a famous radio galaxy with an active galactic nucleus, as viewed by APEX, Chandra, and the Wide Field Imager. Image Credit: ESO/WFI, MPIfR/ESO/APEX/A. 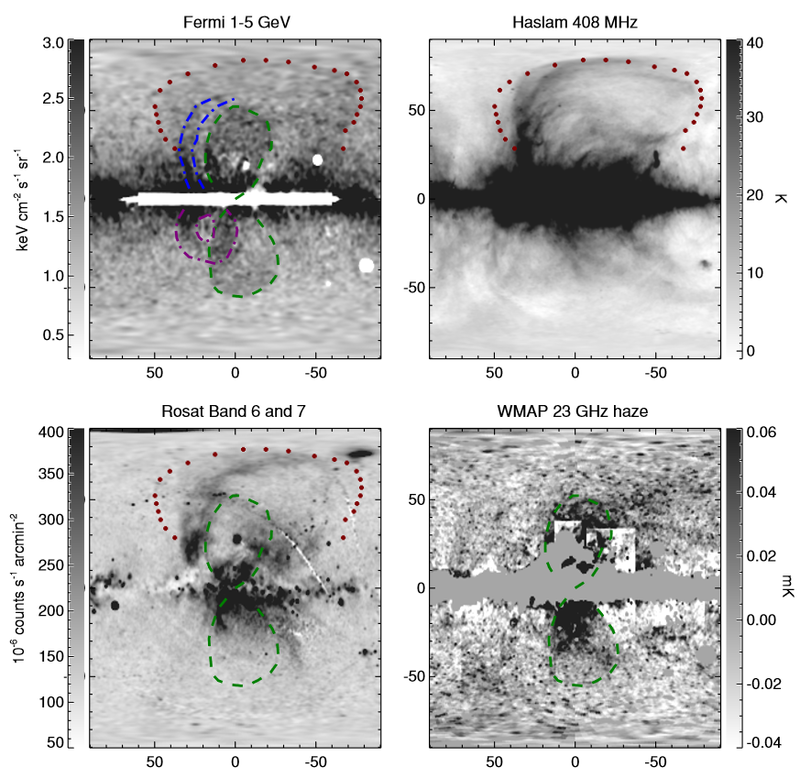 Weiss et al., NASA/CXC/CfA/R. Kraft et al. The Fermi team considered two possible formation scenarios, both involving violent periods in the history of the galaxy. The first suggested that Sagittarius A* has undergone periods of activity in the past, similar to an active galactic nucleus such as a quasar or BL Lac object. This would involve accreting matter, perhaps from tidal disruptions of stars, accretions of interstellar gas or a merger with an intermediate-mass black hole. The result would be bipolar jets, which would energize gas — leading to x-ray emission — and provide a source of cosmic rays. A second possibility was radically different. Starbursts — intense periods of star formation — have been observed in a number of other galaxies, such as NGC 253. The sudden appearance of a population of massive stars can lead to a galactic wind through two mechanisms: momentum imparted by the supernovae that quickly follow the starbursts, and normal radiation pressure from the combination of many individual stellar winds. These winds are believed to be responsible for a number of outflows observed in NGC 253 and similar galaxies. Furthermore, a starburst period would likely generate a large number of cosmic rays. The combination of these phenomena could quite easily be responsible for the formation of the Fermi bubbles. ALMA observations of NGC 253 show outflows of cool gas, structures that may be similar to the precursors of the Fermi bubbles. Image credit: ALMA (ESO/NAOJ/NRAO)/Erik Rosolowsky. While x-ray observations show plenty of signs of past activity in the galactic center, each of these theories has its flaws. For instance, the bubbles appear to emerge perpendicular to the galactic plane, but there’s no reason relativistic jets from an active galactic nucleus would have to be emitted precisely in that direction. A problem with the starburst hypothesis is that we don’t observe quite as many supernova remnants as we might expect from a recent starburst. Nonetheless, it’s quite clear that something big must have happened in the galactic center about ten million years ago. We already have evidence from gamma rays, microwaves and x-rays whispering hints to us about the Milky Way’s past. Recent observations with the Hubble Space Telescope using ultraviolet light from quasars have set further constraints on the age of the bubbles and the speed of expansion of the shock fronts. What will be the next tool to take us deeper into the history of the Fermi bubbles — and what will it tell us? Astrophysics undergrad, currently looking at the skies through gamma-rays and x-rays. I write about deep sky objects and the future of observational astronomy. A blog about the strangest astronomical objects in the universe.